Does your kid ever get into some serious monkey business from time to time? If so, you could probably just wait it out, and they will calm down once they get all of that extra energy out of their system. 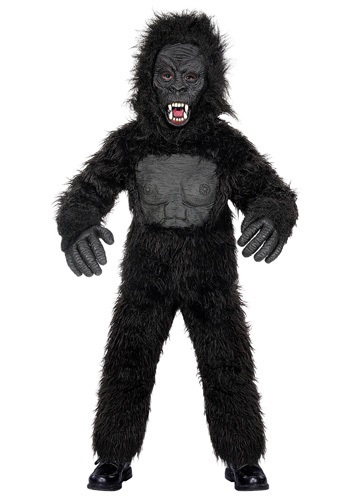 But sometimes, if they really go ape, you may need to take drastic measures, like dressing them up in this awesome Kids Gorilla Costume, so they can really monkey around! It may be hard to believe that a simple, fur covered suit could help your little one bring their inner-animal out, but trust us, it totally works. Lots of kids love jumping around and swinging from trees, no matter what they are wearing, and once they are dressed up in a furry bodysuit, their imaginations will run wild! They may just be playing in the yard or in their rooms, but they'll feel like they are playing deep within an untamed jungle, where beasts and natural wonders are behind every tree. Don't be surprised if you hear your little one growling and making jungle animal calls while they're at it, since this ferocious look can get kids pretty immersed in the action. If your kiddo is ready to suit up in this costume, all they need to do is put on the realistic looking polyester bodysuit and the matching gloves and mask to have a wild time of their own! The suit pieces are covered in soft acrylic faux fur, and feature molded latex around the chest, face, and fingers for extra detail. Be sure to keep an eye on your bananas, since this little gorilla is going to get hungry when they're on the loose!